In my last Thrifty Thursday post I shared a photo of the record cabinet I scored at an op shop. Here she is in all shiny and RED! I love this piece. Retro style is definitely my cup of tea, but I hardly ever find anything in my price range in my area. And while this girl had some issues (the top had a couple of cracks) I still think she's amazing! I used the chalk paint recipe I found at The Apprentice Extrovert (1 part water, 1 part plaster of paris, 3 part paint) and I always knew I wanted to paint her red. It just seemed right, and I picked Kimono Red at the paint shop because it was just dark enough not to be fire engine style. I've left the inside original. What about you - do you like a bit of retro style? Cute Catherine and I am fussy with what retro stuff I like but I love some of it! The first piece I painted with chalk paint was exactly as you described - not exactly long lasting, and definitely not something I could sell! My mistake with the first batch was that I just put each of the ingredients in, not realising that I had to make up the plaster of paris first, stir it really well, then add the paint in last. I also put a bit more paint than the 1/3 1/3 1/3 recipe. I've finished it with Minwax and the finish is good (I've just tried scratching it in a couple of placing, and no issues). I've found chalk paint can be a little weird, and I'm so tempted to buy some milk paint but worried about the same issues. Love retro, and red suits it perfectly!! Just reading the comments above...chalk paint distresses so easily so therefor would scratch off pretty easily but not once its sealed. I only have sealed with beeswax and I'm always happy with that. am yet to try minwax, don't think my hardware place sells it! Thanks for the link too!! 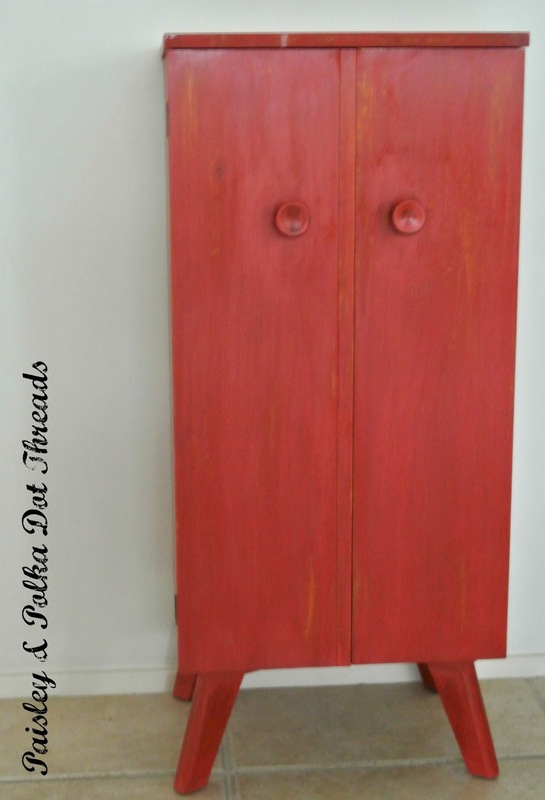 I love anything retro...and I love your red album cabinet!! What an awesome find and excellent transformation! Thrifty Thursday #14 - throw your two cents in! Thrifty Thursday #13 - A few good finds! Thrifty Thursday #12 - What's Going on?